"Dragostea Din Tei" (pronounced [ˈdraɡoste̯a din ˈtej] ( listen), Romanian for "Love from the Lindens"; official English title: "Words of Love"), also informally known as "Ma Ya Hi" and "The Numa Numa Song" (see § Lyrics), is the most successful single by the Moldovan pop group O-Zone. It received positive reviews from critics and shot to the number one spot on the Eurochart Hot 100, where it remained for 12 weeks between June and early September 2004. It topped the single charts in France, Germany and Austria for over three months, reached three in the United Kingdom and 72 on the US Pop 100. The song became the fourth-best-selling single of the 21st century in France, with 1,170,000 units sold. A popular cover of the song was made by Italian-Romanian pop singer Haiducii, which also charted in many countries, especially Italy and Sweden, where it topped the singles charts. The original song was made notable in the United States by the viral video "Numa Numa" in which Gary Brolsma dances to the song. Another remix "Numa Numa 2" with Dan Balan featuring Marley Waters was posted on YouTube on September 12, 2018. Nu mă, nu mă iei, nu mă, nu mă, nu mă iei. The song was written and composed by Dan Bălan, and the original version was sung by Bălan, Arsenie Todiraș, and Radu Sârbu. The single was first released in 2003 in Romania, where the group lived and produced at that time, and in the spring of 2004 in most other European countries, where it became a summer hit. In as late as 2006, the song was still in the lower reaches of some Eastern European singles charts. O-Zone's version was the most popular across Europe, with the exception of Italy, where it was only known by discogoers. A cover version of the song performed by the Romanian singer Haiducii, who released the song in Europe around the same time, was more popular in Italy and Sweden (it reached number 1 in the singles charts). 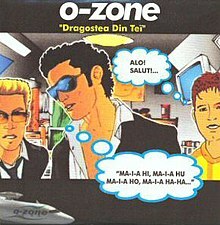 "Dragostea Din Tei" has also inspired a number of parody videos distributed over the Internet, most notably Gary Brolsma's popular "Numa Numa Dance" video in 2004, so named because of the line "nu mă nu mă iei". The "Numa Numa Dance", which first appeared on the flash site Newgrounds.com, has become so notable that it has sparked numerous parodies of the video itself in the United States over the years since 2004. Overall, the single reached number one in over 27 countries and went on to sell upwards of 8 million copies worldwide, making it one of the best-selling singles of all time. The American release of DiscO-Zone features an English version of the song performed by Dan Bălan and Lucas Prata. This version focuses on the "It's me, Picasso" lyric from the original (literal pun) to provide a theme of an artist who has lost his muse. Bălan and Prata performed the English recording of "Dragostea Din Tei" entitled "Ma Ya Hi" on The Today Show on 22 February 2005. Unlike the original recording, however, this version was not as successful, charting at 72 on the Billboard Pop 100. A cover version by Italian-Romanian singer Haiducii, with a strong dance impact, was charted at the same time as the original version by O-Zone. Although it had a great success in many countries, including Sweden, Austria and Italy, where it topped the chart, it was less successful than O-Zone's version. A popular video named "Numa Numa" originally posted on Newgrounds features a person named Gary Brolsma performing a lip-sync to the song while dancing. The video soon spread to other social media sites such as YouTube and went viral. Brolsma was named "#1 Internet Celebrity" on VH1's 40 Greatest Internet Superstars which aired on 23 March 2007. In Brazil, singer Latino replaced all the lyrics to create his reviewed version of "Dragostea Din Tei" (the song still resembles the original one in rhythm and melody). Called "Festa no Apê" (Party at the Apartment), talking about a party that's gone "wild". The song's opening lyrics are sampled in the 2008 song "Live Your Life" performed by T.I. featuring Rihanna. Music of "Live Your Life" is a strong adaptation of the song's basic tune. In 2011, Hank Azaria covered the song as the character "The Mighty Sven" for the animated film Happy Feet Two. Uncle Moishy, an Orthodox Jewish children's entertainer, has sang about healthy eating to the tune of the song. The Hungarian comedy-music group Irigy Hónaljmirigy made a cover of the song with the title "Numerakirály". It is still considered as one of the most popular covers of theirs. A spoof of the song was released by the Romanian metal band Trooper under the name of "Zorzon", as a bonus track on one of their albums. In Spain, the comedy duo Los Morancos made a spoof version called Marica tú (queer you), also sometimes referred to as "pluma pluma gay" (literally "feather feather gay", meaning "sissy sissy gay"), which contained several references to homosexuality. It became popular in many clubs across Hispanic America. Hungarian Minisztár released a Dragostea Din Tei music video in 2005. Portuguese Onda Choc released "Sem Drama Aguardarei" in 2006. Russian songs "Я её хой" by Professor Lebedinsky with Russkiy Razmer and "Эй, ди-джей, водочки налей" by DJ Slon. German group ItaloBrothers released a cover of "Dragostea Din Tei" named "My Life Is a Party" in 2012. Dan Balan recorded a track titled "Sugar Tunes" in 2006, which is a pop rock song that is based on the melody of Dragostea Din Tei. Austrian child singer Lisa Aberer performed a German cover of it at Kiddy Contest 2004 as "Unsichtbar" (Invisible). Dan Balan recorded a revised remixed version with some amended lyrics called "Numa Numa 2" in 2018 featuring additional vocals by Marley Waters and dancing by African Ugandan kids and youth. The music video was recorded in Uganda. German Singer "Frank Lars" Covered a Version called Nur Ma So? In Israel, the song was translated and used as a theme song for the children's show Festigal. Also in Israel, the music was used by the subgroup of Breslover Hasidim known as Na Nach, following the teachings of Rabbi Nachman of Breslov according to the tradition of Rabbi Yisroel Ber Odesser (called the Saba, or grandfather, by Na Nachs). The song in praise of the rabbi titled "Na Nach Nachma Nachman Meuman" uses in its best known version the music from the song "Dragostea Din Tei". An Indonesian version of this song was released by Indonesian group Barakatak with title "Buka-Bukaan" (Open and Open) on 2005 (on YouTube in 2008). Where the lyrics contain adult content, where the title itself refers to sexual activity. There are also three versions sung in Mandarin: Singapore's Jocie Kok (郭美美) wrote "Bu Pa Bu Pa" (不怕不怕, "Not Afraid, Not Afraid")., Taiwan's 2moro wrote "Shabu Shabu", and Elva Hsiao (蕭亞軒) wrote "Lian Ai Feng" (戀愛瘋, "Crazy Love"). In South Korea, Hyun Young, a Korean model/actress/singer, released a Korean version of the song, titled "누나의 꿈" (Nuna-ui Kkum; eng. Sister's Dream) which ranked among the top on various Korean charts in March 2006, within weeks from release. The song preserves the "ma-ia-hii" and "nu mă, nu mă iei" choruses from the original; however, while the "ma-ia-hii" does not carry any meaning, but is merely used as a rhythmic interjection, the "nu mă iei" is approximated as "누나의" (nuna-ui, often pronounced nuna-e), which means "elder sister's". "Nuna" is also an affectionate title a Korean man calls a woman who is older than he is. The lyrics of Sister's Dream are about a romance between a younger man and an older woman. In Japan, Gille sampled the "ma-ia-hii" chorus for her debut single "Girls". Vietnam's Vu Ha, Vietnamese "Người Tình Mai Ya Hee" (Mai Ya Hee, The Lover). A Japanese version of the song was released by comedian Maeda Ken on 24 August 2005 under the artist name Maeken Trance Project (his drag alter-ego), titled "Koi no Buchiage Tengoku: Koi no Maiahi~Chihuahua~Banzai "(恋のブチアゲ 天国：恋のマイアヒ～チワワ～バンザイ, "Love's High Tension Paradise: Love's Maiahi~Chihuahua~Hurrah"), fusing the original song with popular Japanese Eurobeat song Banzai and part of the 2002 ad Coca-Cola commercial-related hit by DJ Bobo titled "Chihuahua". Although this is a Japanese release, the "Dragostea Din Tei" section of the medley is sung in Romanian. On 11 November 2005 another Japanese version under the same title "Koi no Maiahi" was released on the compilation album of Avex record label artists "Girl's Box ~Best Hits Compilation Winter~" (AVCD-17769) by the singers Hasebe Yu (長谷部優) from girlgroup "dream", Iwasaki Mai (岩崎舞), and Takimoto Miori (瀧本美織) both from girlgroup "SweetS". The group also did a nectar, kamehama-honey and crystal remix of this song. A South African version, "Net Die Een Vir My", was sung in Afrikaans by Nicholis Louw and Shine 4. "Numa Numa 2" with Dan Balan ft. Marley Waters was posted on Dan Balan's YouTube Channel on September 12, 2018. It includes vocals from Marley Waters in both Romanian and English, with newer Romanian vocals from Dan, while retaining the chorus from the original "Dragostea Din Tei". ^ a b Paoletta, Michael (16 October 2012). "Music Billboard Picks > Singles > Pop: Dan Balan (of O-Zone) featuring Lucas Prata – Ma Ya Hi". Billboard. Prometheus Global Media. p. 38. ISSN 0006-2510. ^ Alan Feuer; Jason George (26 February 2005). "Internet Fame Is Cruel Mistress for a Dancer of the Numa Numa". The New York Times. Retrieved 16 April 2011. ^ "Top 100 des singles les plus vendus du millénaire en France, le top 10 final!". Chartsinfrance, PureCharts. 13 September 2014. Retrieved 17 March 2015. ^ "The Miya Hee Song! The Numa Numa Song!". Archived from the original on 17 July 2011. ^ "Newgrounds search for 'numa numa'". Newgrounds.com. Archived from the original on 28 August 2007. Retrieved 11 November 2012. ^ Welch, Matt (October 2005). "The Second Romanian Revolution Will Be Televised". Reason. Reason Foundation: 4. Retrieved 13 December 2013. ^ "Offiziellecharts.de – O-Zone – Dragostea din tei". GfK Entertainment Charts. Retrieved 13 February 2019. ^ "Nederlandse Top 40 – week 30, 2004" (in Dutch). Dutch Top 40 Retrieved 2017-12-31. ^ "Dutchcharts.nl – O-Zone – Dragostea Din Teï" (in Dutch). Single Top 100. Retrieved 2017-12-31. ^ "Ediția 34, săptămâna 01.09 – 07.09, 2003" (in Romanian). Romanian Top 100. Archived from the original on 14 May 2005. Retrieved 11 July 2017. ^ "Official Scottish Singles Sales Chart Top 100". Official Charts Company. Retrieved 10 October 2018. ^ a b "Single top 100 over 2004" (PDF) (in Dutch). Top40. Retrieved 5 May 2010. ^ a b "Single Jahrescharts 2004" (in German). MTV. Archived from the original on 16 December 2009. Retrieved 16 January 2010. ^ "Årslista Singlar – År 2004" (in Swedish). Sverigetopplistan. Retrieved 14 September 2018. ^ a b "Die ultimative Chart Show | Hits des neuen Jahrtausends | Download". RTL.de. Retrieved 11 November 2012. ^ "Austrian single certifications – O-Zone – Dragostea Din Tei" (in German). IFPI Austria. Enter O-Zone in the field Interpret. Enter Dragostea Din Tei in the field Titel. Select single in the field Format. Click Suchen. ^ "Gold og platin i september". IFPI Denmark. 14 October 2004. Retrieved 27 April 2013. ^ "Les Singles Diamant :" (in French). Infodisc.fr. Archived from the original on 1 February 2014. Retrieved 27 April 2012. ^ "French single certifications – O-Zone – Dragostea Din Tei" (in French). Syndicat National de l'Édition Phonographique. ^ "Gold-/Platin-Datenbank (O-Zone; 'Dragostea Din Tei')" (in German). Bundesverband Musikindustrie. ^ a b c "Japanese single certifications – オゾン – 恋のマイアヒ" (in Japanese). Recording Industry Association of Japan. Archived from the original on 12 August 2014. Retrieved 11 December 2017. ^ "Dutch single certifications – O-Zone – Dragostea Din Tei" (in Dutch). Nederlandse Vereniging van Producenten en Importeurs van beeld- en geluidsdragers. Enter Dragostea Din Tei in the "Artiest of titel" box. ^ "Guld- och Platinacertifikat − År 2004" (PDF) (in Swedish). IFPI Sweden. ^ "The Official Swiss Charts and Music Community: Awards (O-Zone; 'Dragostea Din Tei')". IFPI Switzerland. Hung Medien. ^ "American single certifications – O-Zone – Mai Ai Hee". Recording Industry Association of America. If necessary, click Advanced, then click Format, then select Single, then click SEARCH. ^ "Austriancharts.at – Haiducii – Dragostea din tei" (in German). Ö3 Austria Top 40. ^ "Ultratop.be – Haiducii – Dragostea din tei" (in Dutch). Ultratop 50. ^ "Ultratop.be – Haiducii – Dragostea din tei" (in French). Ultratop 50. ^ "Danishcharts.com – Haiducii – Dragostea din tei". Tracklisten. ^ "Dutchcharts.nl – Haiducii – Dragostea din tei" (in Dutch). Single Top 100. ^ "Lescharts.com – Haiducii – Dragostea din tei" (in French). Les classement single. ^ "Offiziellecharts.de – Haiducii – Dragostea din tei". GfK Entertainment Charts. Retrieved 13 February 2019. ^ "Italiancharts.com – Haiducii – Dragostea din tei". Top Digital Download. ^ "Norwegiancharts.com – Haiducii – Dragostea din tei". VG-lista. ^ "Swedishcharts.com – Haiducii – Dragostea din tei". Singles Top 100. ^ "Swisscharts.com – Haiducii – Dragostea din tei". Swiss Singles Chart. ^ "Austrian single certifications – Haiducii – Dragostea Din Tei" (in German). IFPI Austria. Enter Haiducii in the field Interpret. Enter Dragostea Din Tei in the field Titel. Select single in the field Format. Click Suchen. ^ "Les Singles Argent :" (in French). Infodisc.fr. Archived from the original on 7 January 2016. Retrieved 27 April 2012. ^ "French single certifications – Haiducii – Dragostea Din Tei" (in French). Syndicat National de l'Édition Phonographique. ^ "The Official Swiss Charts and Music Community: Awards (Haiducii; 'Dragostea Din Tei')". IFPI Switzerland. Hung Medien. ^ "Offiziellecharts.de – Antonia – Wenn der Hafer sticht". GfK Entertainment Charts. Retrieved 13 February 2019. ^ "Numa Numa Dance". Newgrounds.com. Archived from the original on 13 September 2012. Retrieved 11 November 2012. ^ "Latino's Festa No Apê cover of O-Zone's Dragostea Din Tei". WhoSampled. Retrieved 11 November 2012. ^ "T.I. feat. Rihanna's Live Your Life sample of O-Zone's Dragostea Din Tei". WhoSampled. Retrieved 3 June 2010. ^ "Daum 미디어다음 - 뉴스" (in Korean). News.media.daum.net. Archived from the original on 13 October 2007. Retrieved 11 November 2012. ^ "Nicholis Louw's Net Die Een Vir My cover of O-Zone's Dragostea Din Tei". WhoSampled. Retrieved 11 November 2012.